For the theory regarding the regulation of the adaptive immune system, see immune network theory. For the sociological theory, see social network. Network theory is the study of graphs as a representation of either symmetric relations or asymmetric relations between discrete objects. In computer science and network science, network theory is a part of graph theory: a network can be defined as a graph in which nodes and/or edges have attributes (e.g. names). 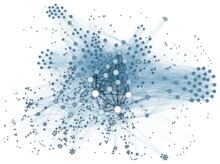 Network theory has applications in many disciplines including statistical physics, particle physics, computer science, electrical engineering, biology, economics, finance, operations research, climatology, ecology and sociology. Applications of network theory include logistical networks, the World Wide Web, Internet, gene regulatory networks, metabolic networks, social networks, epistemological networks, etc. ; see List of network theory topics for more examples. Euler's solution of the Seven Bridges of Königsberg problem is considered to be the first true proof in the theory of networks. Break down a NP-hard network optimization task into subtasks by discarding of the most irrelevant interactions in network. Network problems that involve finding an optimal way of doing something are studied under the name combinatorial optimization. Examples include network flow, shortest path problem, transport problem, transshipment problem, location problem, matching problem, assignment problem, packing problem, routing problem, critical path analysis and PERT (Program Evaluation & Review Technique). In order to break a NP-hard task of network optimization down into subtasks the network is decomposed into relatively independent subnets. (1) an abstract perspective (i.e., as a graph consists from nodes and edges), regardless of the electric power aspects (e.g., transmission line impedances). Most of these studies focus only on the abstract structure of the power grid using node degree distribution and betweenness distribution, which introduces substantial insight regarding the vulnerability assessment of the grid. Through these types of studies, the category of the grid structure could be identified from the complex network perspective (e.g., single-scale, scale-free). This classification might help the electric power system engineers in the planning stage or while upgrading the infrastructure (e.g., add a new transmission line) to maintain a proper redundancy level in the transmission system. (2) weighted graphs that blend an abstract understanding of complex network theories and electric power systems properties. Social network analysis examines the structure of relationships between social entities. These entities are often persons, but may also be groups, organizations, nation states, web sites, or scholarly publications. Since the 1970s, the empirical study of networks has played a central role in social science, and many of the mathematical and statistical tools used for studying networks have been first developed in sociology. Amongst many other applications, social network analysis has been used to understand the diffusion of innovations, news and rumors. Similarly, it has been used to examine the spread of both diseases and health-related behaviors. It has also been applied to the study of markets, where it has been used to examine the role of trust in exchange relationships and of social mechanisms in setting prices. Similarly, it has been used to study recruitment into political movements and social organizations. It has also been used to conceptualize scientific disagreements as well as academic prestige. More recently, network analysis (and its close cousin traffic analysis) has gained a significant use in military intelligence, for uncovering insurgent networks of both hierarchical and leaderless nature. With the recent explosion of publicly available high throughput biological data, the analysis of molecular networks has gained significant interest. The type of analysis in this context is closely related to social network analysis, but often focusing on local patterns in the network. For example, network motifs are small subgraphs that are over-represented in the network. Similarly, activity motifs are patterns in the attributes of nodes and edges in the network that are over-represented given the network structure. Using networks to analyse patterns in biological systems, such as food-webs, allows us to visualize the nature and strength of interactions between species. The analysis of biological networks with respect to diseases has led to the development of the field of network medicine. Recent examples of application of network theory in biology include applications to understanding the cell cycle. The interactions between physiological systems like brain, heart, eyes, etc. can be regarded as a physiological network. The automatic parsing of textual corpora has enabled the extraction of actors and their relational networks on a vast scale. The resulting narrative networks, which can contain thousands of nodes, are then analysed by using tools from Network theory to identify the key actors, the key communities or parties, and general properties such as robustness or structural stability of the overall network, or centrality of certain nodes. This automates the approach introduced by Quantitative Narrative Analysis, whereby subject-verb-object triplets are identified with pairs of actors linked by an action, or pairs formed by actor-object. Link analysis is a subset of network analysis, exploring associations between objects. An example may be examining the addresses of suspects and victims, the telephone numbers they have dialed and financial transactions that they have partaken in during a given timeframe, and the familial relationships between these subjects as a part of police investigation. Link analysis here provides the crucial relationships and associations between very many objects of different types that are not apparent from isolated pieces of information. Computer-assisted or fully automatic computer-based link analysis is increasingly employed by banks and insurance agencies in fraud detection, by telecommunication operators in telecommunication network analysis, by medical sector in epidemiology and pharmacology, in law enforcement investigations, by search engines for relevance rating (and conversely by the spammers for spamdexing and by business owners for search engine optimization), and everywhere else where relationships between many objects have to be analyzed. Links are also derived from similarity of time behavior in both nodes. Examples include climate networks where the links between two locations (nodes) are determined for example, by the similarity of the rainfall or temperature fluctuations in both sites. The structural robustness of networks is studied using percolation theory. 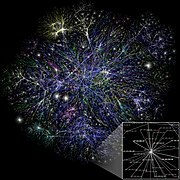 When a critical fraction of nodes (or links) is removed the network becomes fragmented into small disconnected clusters. This phenomenon is called percolation, and it represents an order-disorder type of phase transition with critical exponents. Percolation theory can predict the size of the largest component (called giant component), the critical threshold and the critical exponents. Several Web search ranking algorithms use link-based centrality metrics, including Google's PageRank, Kleinberg's HITS algorithm, the CheiRank and TrustRank algorithms. Link analysis is also conducted in information science and communication science in order to understand and extract information from the structure of collections of web pages. For example, the analysis might be of the interlinking between politicians' web sites or blogs. Another use is for classifying pages according to their mention in other pages. Information about the relative importance of nodes and edges in a graph can be obtained through centrality measures, widely used in disciplines like sociology. For example, eigenvector centrality uses the eigenvectors of the adjacency matrix corresponding to a network, to determine nodes that tend to be frequently visited. Formally established measures of centrality are degree centrality, closeness centrality, betweenness centrality, eigenvector centrality, subgraph centrality and Katz centrality. The purpose or objective of analysis generally determines the type of centrality measure to be used. For example, if one is interested in dynamics on networks or the robustness of a network to node/link removal, often the dynamical importance of a node is the most relevant centrality measure.For a centrality measure based on k-core analysis see ref. These concepts are used to characterize the linking preferences of hubs in a network. Hubs are nodes which have a large number of links. Some hubs tend to link to other hubs while others avoid connecting to hubs and prefer to connect to nodes with low connectivity. We say a hub is assortative when it tends to connect to other hubs. A disassortative hub avoids connecting to other hubs. If hubs have connections with the expected random probabilities, they are said to be neutral. There are three methods to quantify degree correlations. The recurrence matrix of a recurrence plot can be considered as the adjacency matrix of an undirected and unweighted network. This allows for the analysis of time series by network measures. Applications range from detection of regime changes over characterizing dynamics to synchronization analysis. Content in a complex network can spread via two major methods: conserved spread and non-conserved spread. In conserved spread, the total amount of content that enters a complex network remains constant as it passes through. The model of conserved spread can best be represented by a pitcher containing a fixed amount of water being poured into a series of funnels connected by tubes . Here, the pitcher represents the original source and the water is the content being spread. The funnels and connecting tubing represent the nodes and the connections between nodes, respectively. As the water passes from one funnel into another, the water disappears instantly from the funnel that was previously exposed to the water. In non-conserved spread, the amount of content changes as it enters and passes through a complex network. The model of non-conserved spread can best be represented by a continuously running faucet running through a series of funnels connected by tubes. Here, the amount of water from the original source is infinite. Also, any funnels that have been exposed to the water continue to experience the water even as it passes into successive funnels. The non-conserved model is the most suitable for explaining the transmission of most infectious diseases, neural excitation, information and rumors, etc. An interdependent network is a system of coupled networks where nodes of one or more networks depend on nodes in other networks. Such dependencies are enhanced by the developments in modern technology. Dependencies may lead to cascading failures between the networks and a relatively small failure can lead to a catastrophic breakdown of the system. Blackouts are a fascinating demonstration of the important role played by the dependencies between networks. A recent study developed a framework to study the cascading failures in an interdependent networks system. ^ Saleh, Mahmoud; Esa, Yusef; Mohamed, Ahmed (2018-05-29). "Applications of Complex Network Analysis in Electric Power Systems". Energies. 11 (6): 1381. doi:10.3390/en11061381. ^ Saleh, Mahmoud; Esa, Yusef; Onuorah, Nwabueze; Mohamed, Ahmed A. (2017). "Optimal microgrids placement in electric distribution systems using complex network framework". Optimal microgrids placement in electric distribution systems using complex network framework - IEEE Conference Publication. ieeexplore.ieee.org. pp. 1036–1040. doi:10.1109/ICRERA.2017.8191215. ISBN 978-1-5386-2095-3. Retrieved 2018-06-07. ^ Habibi, Iman; Emamian, Effat S.; Abdi, Ali (2014-01-01). "Quantitative analysis of intracellular communication and signaling errors in signaling networks". BMC Systems Biology. 8: 89. doi:10.1186/s12918-014-0089-z. ISSN 1752-0509. PMC 4255782. PMID 25115405. ^ Newman, M. E. J. "The structure and function of complex networks" (PDF). Department of Physics, University of Michigan. ^ a b Ignatov, D.Yu. ; Filippov, A.N. ; Ignatov, A.D.; Zhang, X. (2016). "Automatic Analysis, Decomposition and Parallel Optimization of Large Homogeneous Networks". Proc. ISP RAS. 28 (6): 141–152. arXiv:1701.06595. doi:10.15514/ISPRAS-2016-28(6)-10. ^ Grandjean, Martin (2014). "La connaissance est un réseau". Les Cahiers du Numérique. 10 (3): 37–54. doi:10.3166/lcn.10.3.37-54. Retrieved 2014-10-15. ^ Wasserman, Stanley and Katherine Faust. 1994. Social Network Analysis: Methods and Applications. Cambridge: Cambridge University Press. Rainie, Lee and Barry Wellman, Networked: The New Social Operating System. Cambridge, MA: MIT Press, 2012. ^ Habibi, Iman; Emamian, Effat S.; Abdi, Ali (2014-10-07). "Advanced Fault Diagnosis Methods in Molecular Networks". PLOS ONE. 9 (10): e108830. Bibcode:2014PLoSO...9j8830H. doi:10.1371/journal.pone.0108830. ISSN 1932-6203. PMC 4188586. PMID 25290670. ^ Barabási, A. L.; Gulbahce, N.; Loscalzo, J. (2011). "Network medicine: a network-based approach to human disease". Nature Reviews Genetics. 12 (1): 56–68. doi:10.1038/nrg2918. PMC 3140052. PMID 21164525. ^ Jailkhani, N.; Ravichandran, N.; Hegde, S. R.; Siddiqui, Z.; Mande, S. C.; Rao, K. V. (2011). "Delineation of key regulatory elements identifies points of vulnerability in the mitogen-activated signaling network". Genome Research. 21 (12): 2067–81. doi:10.1101/gr.116145.110. PMC 3227097. PMID 21865350. ^ Bashan, Amir; Bartsch, Ronny P.; Kantelhardt, Jan. W.; Havlin, Shlomo; Ivanov, Plamen Ch. (2012). "Network physiology reveals relations between network topology and physiological function". Nature Communications. 3: 702. arXiv:1203.0242. Bibcode:2012NatCo...3E.702B. doi:10.1038/ncomms1705. ISSN 2041-1723. PMC 3518900. PMID 22426223. ^ Tsonis, Anastasios A.; Swanson, Kyle L.; Roebber, Paul J. (2006). "What Do Networks Have to Do with Climate?". Bulletin of the American Meteorological Society. 87 (5): 585–595. Bibcode:2006BAMS...87..585T. doi:10.1175/BAMS-87-5-585. ISSN 0003-0007. ^ Yamasaki, K.; Gozolchiani, A.; Havlin, S. (2008). "Climate Networks around the Globe are Significantly Affected by El Niño". Physical Review Letters. 100 (22): 228501. Bibcode:2008PhRvL.100v8501Y. doi:10.1103/PhysRevLett.100.228501. ISSN 0031-9007. PMID 18643467. ^ Boers, N.; Bookhagen, B.; Barbosa, H.M.J. ; Marwan, N.; Kurths, J. (2014). "Prediction of extreme floods in the eastern Central Andes based on a complex networks approach". Nature Communications. 5: 5199. Bibcode:2014NatCo...5E5199B. doi:10.1038/ncomms6199. ISSN 2041-1723. PMID 25310906. ^ R. Cohen; S. Havlin (2010). Complex Networks: Structure, Robustness and Function. Cambridge University Press. ^ A. Bunde; S. Havlin (1996). Fractals and Disordered Systems. Springer. ^ Attardi, G.; S. Di Marco; D. Salvi (1998). "Categorization by Context" (PDF). Journal of Universal Computer Science. 4 (9): 719–736. ^ Restrepo, Juan; E. Ott; B. R. Hunt (2006). "Characterizing the Dynamical Importance of Network Nodes and Links". Phys. Rev. Lett. 97 (9): 094102. arXiv:cond-mat/0606122. Bibcode:2006PhRvL..97i4102R. doi:10.1103/PhysRevLett.97.094102. PMID 17026366. ^ Carmi, S.; Havlin, S.; Kirkpatrick, S.; Shavitt, Y.; Shir, E. (2007). "A model of Internet topology using k-shell decomposition". Proceedings of the National Academy of Sciences. 104 (27): 11150–11154. arXiv:cs/0607080. Bibcode:2007PNAS..10411150C. doi:10.1073/pnas.0701175104. ISSN 0027-8424. PMC 1896135. PMID 17586683. ^ Marwan, N.; Donges, J.F. ; Zou, Y.; Donner, R.V. ; Kurths, J. (2009). "Complex network approach for recurrence analysis of time series". Physics Letters A. 373 (46): 4246–4254. arXiv:0907.3368. Bibcode:2009PhLA..373.4246M. doi:10.1016/j.physleta.2009.09.042. ISSN 0375-9601. ^ Donner, R.V. ; Heitzig, J.; Donges, J.F. ; Zou, Y.; Marwan, N.; Kurths, J. (2011). "The Geometry of Chaotic Dynamics – A Complex Network Perspective". European Physical Journal B. 84 (4): 653–672. arXiv:1102.1853. Bibcode:2011EPJB...84..653D. doi:10.1140/epjb/e2011-10899-1. ISSN 1434-6036. ^ Feldhoff, J.H. ; Donner, R.V. ; Donges, J.F. ; Marwan, N.; Kurths, J. (2013). "Geometric signature of complex synchronisation scenarios". Europhysics Letters. 102 (3): 30007. arXiv:1301.0806. Bibcode:2013EL....10230007F. doi:10.1209/0295-5075/102/30007. ISSN 1286-4854. ^ Newman, M., Barabási, A.-L., Watts, D.J. [eds.] (2006) The Structure and Dynamics of Networks. Princeton, N.J.: Princeton University Press. ^ S. V. Buldyrev; R. Parshani; G. Paul; H. E. Stanley; S. Havlin (2010). "Catastrophic cascade of failures in interdependent networks". Nature. 464 (7291): 1025–28. arXiv:0907.1182. Bibcode:2010Natur.464.1025B. doi:10.1038/nature08932. PMID 20393559. ^ Jianxi Gao; Sergey V. Buldyrev; Shlomo Havlin; H. Eugene Stanley (2011). "Robustness of a Network of Networks". Phys. Rev. Lett. 107 (19): 195701. arXiv:1010.5829. Bibcode:2011PhRvL.107s5701G. doi:10.1103/PhysRevLett.107.195701. PMID 22181627. Kitsak, M.; Gallos, L. K.; Havlin, S.; Liljeros, F.; Muchnik, L.; Stanley, H. E.; Makes, H.A. (2010). "Influential Spreaders in Networks". Nature Physics. 6 (11): 888. arXiv:1001.5285. Bibcode:2010NatPh...6..888K. doi:10.1038/nphys1746. ^ Kimmo., Soramäki (2016). Network theory and financial risk. Cook, Samantha (Statistician). [London]: Risk Books. ISBN 978-1782722199. OCLC 973733901. This page was last edited on 6 March 2019, at 02:18 (UTC).